For years, Rudolph the Red-Nosed Reindeer has brightened the holidays! Celebrating the special place it holds the hearts of Christmas lovers, Jim Shore reimagines the film's most iconic scenes in his signature folk art style. Rudolph basks in the glow of Santa's love in this handcrafted design. Intricately sculpted from stone resin, the statue captures the endearing qualities of the beloved holiday special. Whimsical snowflakes dance around the base. Every detail is hand-carved and hand-painted by a team of skilled artisans. 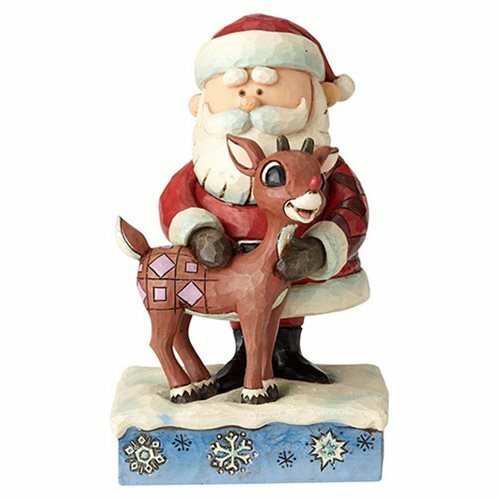 The Rudolph the Red-Nosed Reindeer Santa Hugging Rudolph Statue by Jim Shore measures about 5 9/10-inches tall x 4 1/10-inches wide x 3 7/8-inches wide.